Not at all a favourite character of mine, but from the excellent head sculpt to the interchangeable arms and body this figure is a winner hands down. The esssence of the character has been truly captured and the options for display make this figure loads of fun to boot. Honourable Mentions: COIE E2 Huntress and Infinite Crisis Power Girl Crisis on Infinite Earths Wave 3 received alot of negative press (more on that later) which somewhat overshadowed the excellent work done on the Earth Two Huntress. She blends in beautifully with other JSA figures, has an excellent head sculpt and I love the longer, flowing cape, Power Girl isn't a favourite of mine either, but for me this is an outstanding sculpt that reflects the character outstandlingly and thus it deserves a mention. Great character selection (Salaak!! ), great quality control, there's nothing much one can say bad about this wave. 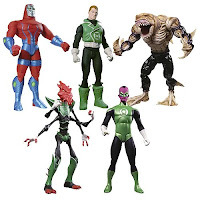 To quibble, while it's great to have Sinestro as a Green Lantern, this could have waited until we've seen some other characters in plastic for the first time, such as Abin Sur, G'nort or the recently returned Arisia. Still, it's a great figure to score. Infinite Crisis Wave 1 has a major flaw for me: the super-sized Mongul. Yep, on its own he's a great figure, but why is that big? Have we ever seen him that big in the comics? It clangs for me. 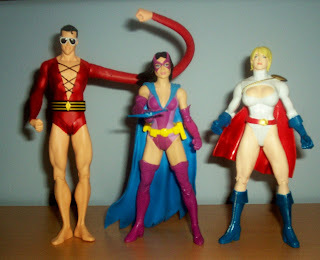 McGuinness haters will scream about me including JLA Classified Wave 1 here, but I was totally taken by surprise by these figures. I expected to hate them but when put together with the Superman and Batman from Supes/Bats Series 1 they make an awesome Big 7. For some reason the cookie-cutter sculpts don't bug me. Again, Martian Manhunter is too big in this line compared to what we've seen in the comics, and that's my online gripe about this wave. Okay, we're all clear on the fact that Michael Turner's art does not a good action figure make (Identity Crisis Black Canary anyone??). That being said, this is without a doubt the worst piece of rubbish I have ever seen. She looks straight out of an annorexic freakshow, not to mention the fact that someone or thing really heavy obviously sat on her face for a very long time. To add insult to injury, the blasted thing cannot stand up, even on the display base!! How this one ever got out of the gate I have no idea. There's a reason these figures have earned the nickname "Regurgitated!". Look no further than poor WW for the reason. If the Turner Supergirl looks like someone's sat on her face, than this figure looks like she's done a couple of rounds with a steamroller and come off the loser. Another one that never should have left the station. Disaster Wave of the Year: Superman / Batman Series 2: Turner Attacks Again! Yep, this wave takes out the award for Worst Leading Lady and Worst Ensemble. The Darkseid is almost funky (but again too huge - check out the comics DCD, he's actually NOT that big) but the rest of the team is a train wreck in motion, If there was ever an argument to bring artist-specific lines to an end, this is the poster child. 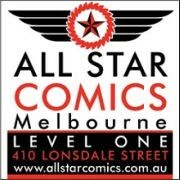 Dishonourable Mention: Anything based on Tim Sale art. Nuff said. get to a Bronze Age Batman. I have to be honest here and say that on its own I don't dislike this figure, but in terms of what it should have been, its a disaster that even Mr G. Brewer himself has acknowledged: the scale is way off and the resemblance to anything near a Perez Crisis Batman just isn't there. Brewer says we'll get our Bronze Age Batman. I won't be holding my breath. Again, something else that many fans have been waiting for that DCD botched. Poor character selection and slightly oversized figures mean we've probably seen the last of these, which is a giant shame. And finally, the "What the...." Award for 2006: The Weaponer of Qward from COIE Wave 3. Oh. my. God. Since when is "Super Squatting" a power?? And the expression on this dudes' face? He looks like he's doing a..... or someone's shoving a..... well whatever it is, it just isn't right. That's my potted summary of the year that was in DCD land. I've only touched the 6" (or thereabouts) figures here but I am loving alot of the 13" stuff and will write on those another time. If you stopped by, thanks. If you made it to the end, even better. Most of my posts here won't be quite so long-winded but I do hope to make it a regular thing so please come back. Agree with me? Think I'm nuts? Leave me a comment and let me know! This is a great article. Really just-- as Spec said on the MESS-- "nailed it" in terms of 2006. This article should be REQUIRED READING for Georg, Shawn, and everyone at DC Direct. Sweet Review! Right on the ball, could'nt have said it better.